REGINA, June 4, 2018 /CNW/ - Input Capital Corp. ("Input" or the "Company") (TSX Venture: INP) (US: INPCF) today released an operational update on business developments in the quarter to date. 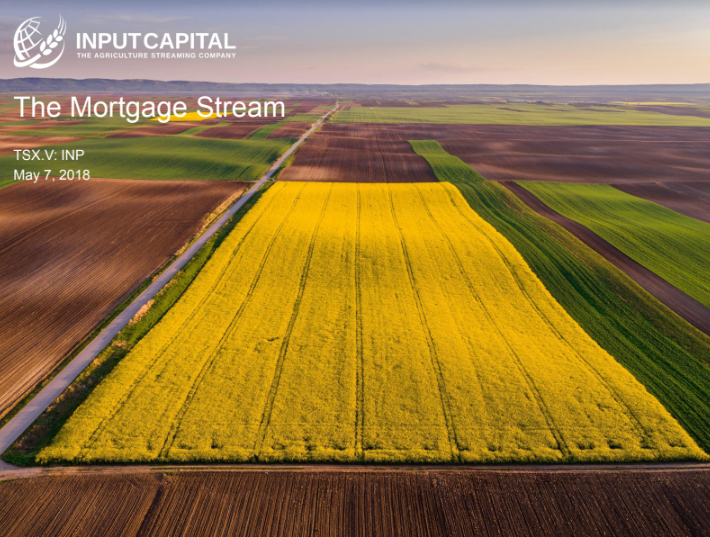 "Since January 30th, Input has approved over $25 million in mortgage streams. This is the most rapid uptake of a new product in Input's history when measured by capital deployed. We believe that mortgage streams are likely to grow into the largest segment of Input's business. Most of the farmers who signed up for mortgage streams also added a marketing stream at the same time. "Total approved capital deployments into streams of all types was over $14 million in April and May, representing the best April/May deployment in Input's history. "Input now has active streaming contracts with 375 farmers across western Canada (up from 353 at March 31). This number has grown consistently every quarter since the Company was launched in 2012. Emsley continued: "Concerns about dry conditions and drought in SE Saskatchewan and SW Manitoba have dissipated over the last week, as significant widespread rain has provided the moisture needed to get the crop off to a very good start. More timely rains appear to be in the forecast for the coming weeks. "We are continuing to buy back shares under the Company's Normal Course Issuer Bid, announced last December, because it is our continued view that the Company's shares are undervalued. Input has a strong balance sheet with $9.6 million in cash, $4.5 million in debt, and a book value of $106 million." Input continues to grow and diversify its low cost canola production profile by entering into streaming contracts with canola farmers across western Canada. Input is focused on farmers with quality production profiles, excellent upside yield potential, and strong management teams.